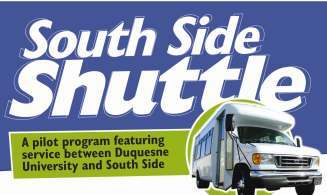 Duquesne University offers shuttle service between campus and South Side for students, faculty and staff. The shuttle bus has seating for 25, offering our South Side resident students a convenient and inexpensive way to get to class, study sessions and other events. South Side shuttle passes for the 2018-2019 school year will cost $200.00 per semester. All passes will be available for pick up at the Parking and DU Card Services Office once they are ordered online. Please contact the Parking and DU Card Services Office at 412.396.5267 or parking@duq.edu should you have any questions. 1 Shuttle 7:00 a.m.-2:00 p.m.
1 Shuttle 2:00 p.m.-10:00 p.m.
Track the Shuttle Live via Double Map or download the free app on your smartphone! Shuttle operations will follow the academic calendar. There is no service on weekends, during breaks, summer semester, holidays, or if classes are cancelled. Shuttle service to commence on Monday, August 27th, 2018 and to end service on Wednesday, December 19th, 2018. Shuttle service to commence on Thursday, January 10th, 2019 and to end service on Wednesday, May 8, 2019. McAnulty Drive & Forbes Ave.
Magee St. & Forbes Ave.
22nd & East Carson St.